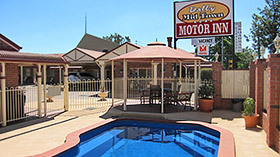 Dalby Mid Town Motor Inn offers a range of 4 star, non-smoking, air conditioned, ground floor suites with spacious en suites providing instant hot water flow and a range of luxury toiletries. 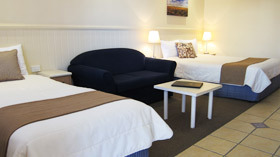 Dalby Mid Town Motor Inn offers spacious and comfortable adjoining rooms for families. 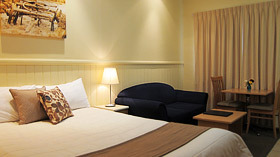 For guests wanting in-room facilities, some rooms are with equipped kitchenettes that include a microwave, electric fry pan, cutlery and crockery. These rooms are available on request. 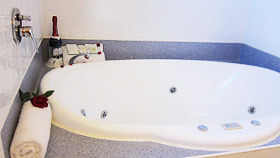 For that special occasion or just a good hot soak, the Queen Spa Suites offer a large two person spa bath. Ideal as a honeymoon suite. 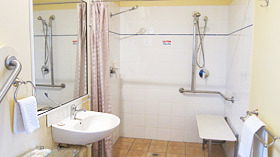 Dalby Mid Town Motor Inn has rooms to suit the elderly and disabled guests. 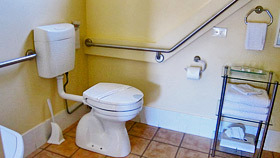 These rooms have wheelchair access, drop down seats in the showers, and, lower basin and rail heights for ease and comfort. 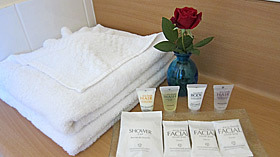 1 Queen size bed, en suite with hairdryer and a selection of toiletries. Tea and coffee making facilities, toaster, microwave, bar fridge, reverse split system air conditioning, flat screen TV, DVD player, 2 Seater Couch, Small Dining table and 2 chairs, desk and chair, iron and full size ironing board. Free car parking, some are undercover. 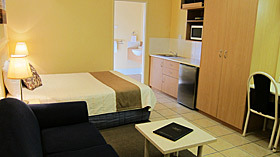 1 Queen size bed, 1 single bed, 2 Seater Couch which can fold out to a single bed, en suite with hairdryer and a selection of toiletries. 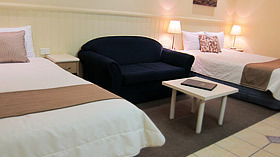 Tea and Coffee making facilities, toaster, microwave, bar fridge, reverse split system air conditioning, flat screen TV, DVD player, desk and chairs, iron and full size ironing board. Free car parking, some are undercover. 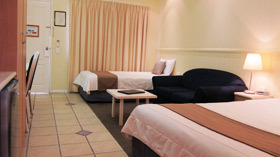 1 Queen size bed, 1 Long Single bed, 2 Seater Couch which can fold out to a single bed, en suite with hairdryer and a selection of toiletries. 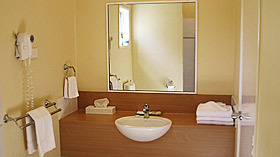 Tea and Coffee making facilities, microwave, frypan, cutlery and crockery, toaster, larger bar fridge, extra bench space and sink, reverse split system air conditioning, flat screen TV, DVD player, desk and chairs, iron and full size ironing board. Free car parking, some are undercover. 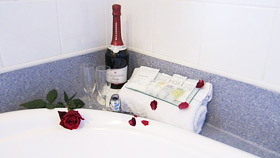 1 Queen size bed, en suite with large 2 person Spa bath, hairdryer and a selection of toiletries. Tea and Coffee making facilities, toaster, microwave, bar fridge, reverse split system air conditioning, flat screen TV, DVD player, 2 Seater Couch, Small Dining table and 2 chairs, desk and chair, iron and full size ironing board. Free car parking, some are undercover. 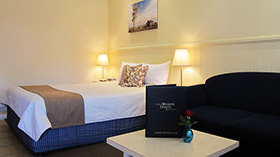 Extra Wide suite suitable for wheel chair access with 1 Queen size bed, en suite with disable access facilities, hairdryer and a selection of toiletries. Interconnecting access to another Queen Suite. Tea and Coffee making facilities, toaster, microwave, bar fridge, reverse split system air conditioning, flat screen TV, DVD player, 2 Seater Couch, desk and chairs, iron and full size ironing board. Free car parking. 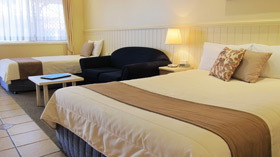 Extra Wide suite suitable for wheel chair access with 1 Queen size bed, 1 Long Single bed and a 2 seater couch which can be folded out to a single bed, en suite with disable access facilities, hairdryer and a selection of toiletries. Interconnecting access to another Queen + Single Suite. Tea and Coffee making facilities, toaster, microwave, bar fridge, reverse split system air conditioning, flat screen TV, DVD player, 2 Seater Couch, desk and chairs, iron and full size ironing board. Free car parking.